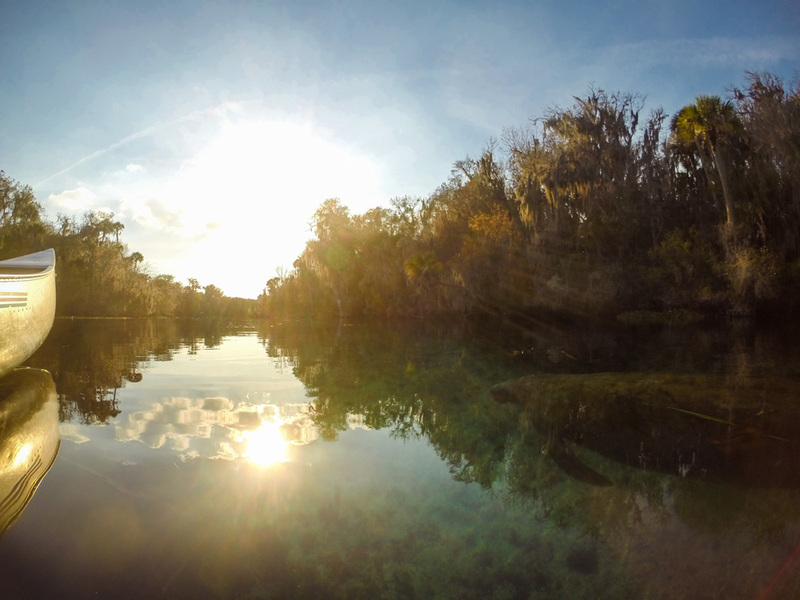 Northern Florida contains one of the highest concentrations of natural springs in the world. The region's limestone geology, and abundant rainfall have led to the formation of an extensive network of underground caves and rivers. Where geology dictates, these underground rivers are pushed to the surface, and a spring is created. The water, after being filtered during its underground journey, often comes to the surface stunningly clear, and reflects sunlight in spectacular tones of greens and blues. Once out of the ground, the water travels through the spring run, which can be anywhere from a few feet to several miles. As it travels, the spring run gathers tributaries which are often not spring sourced, and may be tinted yellow or brown with tannins. Gradually, the water looses its clarity and viability decreases. Northern Florida has be called a subtle landscape. It does not have dramatic mountains or rocky sea shores. Most it is forested or covered in pasture land. Especially in winter, the most common colors are brown and gray. This is in part what makes coming upon a natural spring so shocking. It's like discovering a sapphire in a pile of leaves. It's so much more dramatic for its unexpectedness. The springs are home to a wide variety of life, and are diversity hot spots. A huge variety of birds use the springs either as permanent homes or as temporary stops during migration. Surprisingly, depending on their distance from the sea, springs can support both fresh water and salt water species of fish. Reptiles including the American alligator and several species of turtles and snakes rely on the springs for consistent year round temperature. Perhaps most famously, the West Indian manatee (Trichechus manatus) travels up spring runs in the cold winter months to escape to warmer waters from the sea. The springs of north Florida are under threat from several sources. As Florida's population continues to grow (it passed New York in 2015 to become the third most populous state after California and Texas), fresh water is increasingly in demand. Every time a new well is dug, the flow of the springs decreases that much more. Eventually, springs will reach the point where they cease to flow. Springs are also very susceptible to pollution. Fertilizer from lawns and golf courses, agricultural waste from livestock, industrial chemicals and raw sewage have all found their ways into the aquifer, and thus into the springs. Increases in nitrogen and phosphorous lead to and increase in algae growth which cause decreased water clarity. I hope that by sharing my images I can make a small contribution in raising awareness of the unique beauty of Florida's springs. A west Indian manatee, (Trichechus manatus), glides silently below Silver Glen Spring, Florida. A west Indian manatee (Trichechus manatus) floats suspended in space , Silver Glen Spring, Florida. Florida gar, (Lepisosteus platyrhincus) hide in the shadows, Ichetucknee Spring, Florida. Florida Gar, (Lepisosteus platyrhincus) bunch together under floating mats of vegetation competing for the best ambush spot. Ichetucknee Spring, Florida. Flathead Grey Mullet, (Mugil cephalus) school in one of the crystal clear spring-heads of Ichetucknee Spring, Florida. A pair of juvenile American alligators, (Alligator mississippiensis) hide under floating vegetation waiting for dinner to swim by. Silver Glen Spring, Florida. Flathead Grey Mullet, (Mugil cephalus) swim across the boundary where blue spring water meets slightly tannin colored water. Mullet have evolved camouflage to blend in to the water where they spend most of their time. Weeki Wachee Spring, Florida. Two Florida gar, (Lepisosteus platyrhincus) swim in formation. Ichetucknee Spring, Florida. A river cooter, (Pseudemys concinna) swims across the top of eel grass (Vallisneria). Ichetucknee Spring, Florida. A Florida Gar, (Lepisosteus platyrhincus) hovers just below the surface of Ichetucknee Spring, Florida. The gar family,(Lepisosteidae) evolved during the late Cretaceous, and since that time has changed very little. West Indian Manatees, (Trichechus manatus) enjoying the warm waters of Volusia Blue Spring, Florida. A West Indian manatee, (Trichechus manatus) shows scars, most likely from boat propeller strikes. Silver Spring, Florida. West Indian Manatees, (Trichechus manatus) swim and congregate in Volusia Blue Spring, Florida. A West Indian manatee, (Trichechus manatus) showing a recent scar from a boat propeller strike. Silver Spring, Florida. Juvenile American alligators, (Alligator mississippiensis) bask in the sun near the bank of Silver Glen Spring, Florida. While alligators do not nurture their offspring, even non-related adult alligators are known to come to the aid of juveniles upon hearing distress cries. A green heron, (Butorides virescens) perches above the waters of Silver Glen Spring, Florida and watches for dinner. Green heron are among the most intelligent of the heron family. They have been known to use fishing lures to attract small prey. Flathead grey mullet, (Mugil cephalus) school in Ichetucknee Spring, Florida. A juvenile turtle Sp. unknown, Rainbow Springs, Florida. Primitive looking Florida gar, (Lepisosteus platyrhincus) school while facing into the current. Ichetucknee Spring, Florida. A solitary West Indian Manatee, (Trichechus manatus) is illuminated by the setting sun. Silver Glen Spring, Florida.